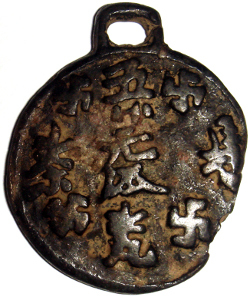 I received a fascinating email from a visitor to my website from Kazakhstan in which he described a rare ancient zodiac charm in his possession. The Chinese zodiac is based on a twelve year cycle with an animal having unique qualities representing each year. The zodiac charm discussed here has the animals displayed on one side. The other side has a Chinese inscription and symbols including several swastikas. “Actually my interest in zodiac charms has appeared because I have one. One great archaeologist gifted it to my grandfather many years ago. It was found around 1940-1950 in the Southern Kazakhstan. Photos of mine charm are attached to this mail. It’s size is 43 mm in diameter, 2mm – thickness. It is made of bronze. “Our national institute of archeology have carefully viewed this charm and have stated that it’s age seems to be about 1st. century BCE. As I’ve discovered from your web site, it was the period of occurrence of such kind of charms (Han Dynasty), and the rise of popularity of them was few ages later till Ming Dynasty. “One interesting thing about my charm is that the statements in Chinese on the front side of it are translated as follows: “The first one”, “The honorable”, “The noble”, or “I’m the noble”, “I’m the first”, “I’m the honorable”. Our scientists say, that it is possible, that this charm was owned by some powerful person, or family chief, etc. As it was stated on your web site, there were a great numbers of charms, depicting different purposes: for good luck, for marriage, for some other purposes. Basing on such type of categories, I’m concluding, that my charm appears to be the charm of “power”, or the charm of “gentility”. Did you ever hear about charms of “power” or “gentility”? “None of my Chinese reference books discuss any charm quite like yours. It may very well have originated in the ancient lands of Kazakhstan and therefore have distinctive characteristics particular to that region of the world. “I am not familiar with charms of “power”. However, there were tallies, such as the famous “tiger tallies”, used in ancient China as symbols of authority. Perhaps your charm had a similar purpose. “The very first Chinese money did not have holes in the middle. In fact, they were not even round and did not resemble coins as we know them. They were based on implements such as shovels and knives. “I should have mentioned in my first message that another reason ancient Chinese coins had a hole in the center was that their value was fairly low (especially compared to gold, silver and jade) and to make purchases a person needed to use many coins. The hole in the middle facilitated carrying the coins because the coins could be placed on a string. A typical “string” of cash coins might have 100 or 1,000 coins. 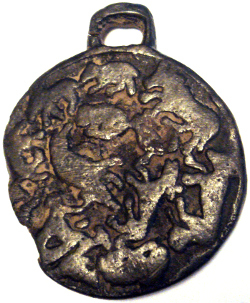 “Early charms tended to be modeled after coins and therefore most had a square or round hole in the center. The charm could be worn around the neck as a necklace or hung from the waist. However, there was no need to carry a large number of charms on a string so, unlike coins, the hole in the center was not really needed. As is the case with your charm, a number of charms were made as pendants to be worn. “This is the practical reason why most Chinese coins and charms have square holes. “There is a philosophical reason for the square hole as well. The Chinese believed that heaven was a “circle” and the earth was a “square”.